Although our Pennsylvania trip already seems like a distant memory, there are a few more pictures which we haven't yet posted. 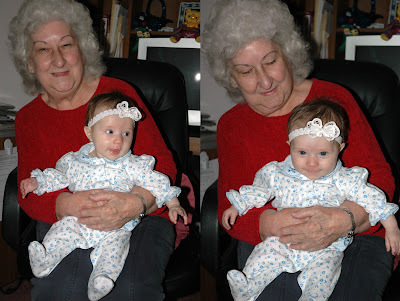 For starters, Ava got to meet her Great Grandma Pickett, whom she really enjoyed cuddling with. While we were at Great Grandma Pickett's house, Larry's Aunt Cindy came to visit. Also, Larry's Aunt Jyn and cousin Katrin were up from DC visiting for Easter. 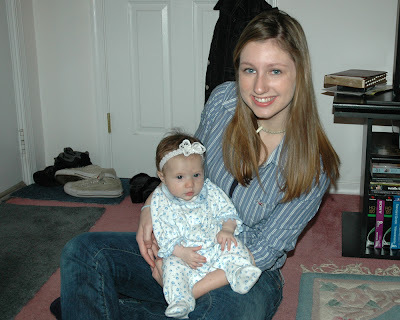 Here's Ava with Katrin, whom we look forward to seeing out in Utah again this summer. 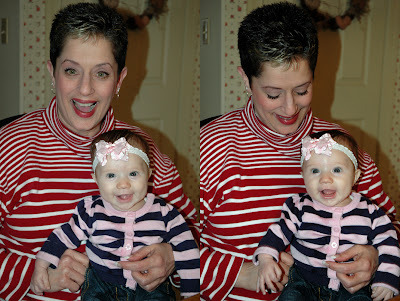 Ava also received a visit at Grandma and Grandpa Furr's house from Larry's Aunt Cheri, who really got Ava laughing and smiling. All in all, Ava got to meet a lot of fun people on her daddy's side of the family. She looks like she did have fun...too bad they have to be so far away huh. We know the feeling :( At least they have pictures to look back on though!! She's so cute! !